Abstract. Early start of dialysis has been hypothesized to prevent deterioration of nutritional status and to lead to a better clinical outcome. According to the National Kidney Foundation/Dialysis Outcomes Quality Initiative guidelines, dialysis should be started when renal Kt/Vurea falls below 2.0/wk or the protein equivalent of total nitrogen appearance normalized to body weight (nPNA) falls below 0.8 g/kg per d. The present study was performed 0 to 4 wk before the start of dialysis treatment in 114 incident Dutch patients with chronic renal failure who all had received pre-end-stage renal disease care. The objectives were (1) to analyze the relationship of different levels of residual renal function with parameters of nutritional status and (2) to investigate the relationship of renal Kt/Vurea and nPNA in this population. The mean GFR at the start of dialysis treatment was 6.2 ml/min per 1.73 m2, and the Kt/Vurea was 1.3/wk. Only 10% of the patients fulfilled the Dialysis Outcomes Quality Initiative criterion of Kt/Vurea > 2.0/wk. In contrast, 69% met the nPNA norm of 0.8 g/kg per d. Seventy-one percent of these patients had a normal nutritional status as scored by subjective global assessment and also other parameters of nutritional status, such as body mass index, and serum albumin fell within the normal range in the majority of the patients. Dutch predialysis patients reached a higher nPNA with the same level of Kt/Vurea compared with U.S. predialysis patients. Implications of these findings are that guidelines on the initiation of dialysis treatment derived from one population are not necessarily valid in other populations. The indications to initiate dialysis treatment in patients with chronic renal failure are subject to discussion. Besides the presence of obvious uremic symptoms, many nephrologists consider a creatinine clearance of approximately 5 ml/min a reasonable indication for starting dialysis to prevent the development of severe uremic complications (1,2). Studies showing an excess mortality in patients referred at a late stage point out that this value may be considered a minimum (2,3,4). Uremia is known to inhibit appetite. Ikizler et al. (5) reported a decrease in dietary protein intake with declining creatinine clearance in patients with chronic renal failure. This decline started already at a creatinine clearance of 50 ml/min. Also a reduction in creatinine excretion was found, suggesting loss of muscular mass. Moreover, a serum albumin concentration below 40 g/L at the initiation of dialysis was associated with decreased survival (6). These findings have been interpreted as indications for the development of malnutrition in chronic renal failure. To prevent this, an earlier start of dialysis has been promoted (6). As early as the 1970s, Bonomini et al. (7,8) advocated to start dialysis when endogenous creatinine clearance was 10 to 15 ml/min. In accordance with the adequacy targets for peritoneal dialysis, the peritoneal dialysis adequacy work group initiated by the National Kidney Foundation in the United States as part of the Dialysis Outcomes Quality Initiative (NKF-DOQI) developed even more stringent criteria (9). The committee provided two clinical guidelines on when to initiate dialysis. The first one is based on the level of renal function measured as Kt/Vurea (urea clearance normalized to total body water). The second is based on the level of protein intake estimated by nPNA (protein equivalent of total nitrogen appearance normalized to body weight) calculated from urinary nitrogen output and non-urea nitrogen losses. According to these guidelines, dialysis should be started when Kt/Vurea falls below 2.0/wk or nPNA falls below 0.8 g/kg per d, unless certain conditions indicating an optimal and stable clinical situation are fulfilled. For weekly Kt/Vurea, the value of 2.0, roughly equivalent to a creatinine clearance of 14 ml/min, was obtained from adequacy guidelines for patients who are receiving continuous ambulatory peritoneal dialysis (CAPD). Likewise, the value of 0.8 for nPNA was derived from studies in CAPD patients (10). Mehrotra et al. (11) showed that in patients with continuous clearances (CAPD patients and predialysis chronic renal failure patients), Kt/Vurea values of 2.0/wk were associated with an nPNA of 0.9 g/kg per d or greater. These findings are likely to have influenced the DOQI guidelines. The DOQI working group thereby assumed that the control of uremic symptoms at a given level of urea clearance by the kidney is similar to that by PD with the same urea clearance. However, in the native kidney substances, for example, organic acids are excreted not only by glomerular filtration but also by tubular secretion. Consequently, for a given amount of filtered urea and creatinine, a certain quantity of other uremic toxins is excreted by tubular secretion. Moreover, the kidney has a hormonal function. We therefore hypothesized that the relationship between urea clearance and nutritional status could be different in predialysis patients compared with patients on dialysis. If so, this would be reflected in a different relationship between nPNA and Kt/Vurea. The present study was performed just before the start of dialysis treatment in incident Dutch patients with chronic renal failure who all had received pre—end-stage renal disease care (pre-ESRD care). The objectives were (1) to analyze the relationship of different levels of residual renal function with parameters of nutritional status and (2) to investigate the relationship of renal Kt/Vurea and nPNA in this population. New ESRD patients, of 18 yr and older, from 25 Dutch dialysis units were consecutively included between August 1996 and February 1998. These patients participated in the Netherlands Co-operative Study on the Adequacy of Dialysis, phase 2 (NECOSAD-2). Eligible for the study were patients who had received pre-ESRD care for at least 1 mo and whose residual renal function could be estimated 0 to 4 wk before the start of dialysis treatment. The targets and content of pre-ESRD care were beyond the scope of the NECOSAD study and decided on by the participating nephrologists. The definition of pre-ESRD care is not uniform; the majority of studies use a period of more than 1 mo, whereas some use a period of 3 mo between the first presentation to a nephrologist and the start of dialysis (12,13). Using the 1-mo definition, all patients received pre-ESRD care and 97% met the 3-mo criterion. Informed consent was obtained from all patients before inclusion. No prescription for the treatment of the patients or when to initiate dialysis was given to the participating nephrologists. Three mo after the start of dialysis treatment, subjective global assessment (SGA) of the nutritional status was performed using a modification of the method originally described by Baker et al. (19). In this modification, nutritional status is expressed on a 7-point scale (20,21). Results are expressed as means and SD. Standard descriptive statistics were used. Independent sample t tests were applied for testing differences in scores of continuous variables. χ2 tests were used to compare the distribution of dichotomous and categorical data. In addition, Pearson's correlation and linear regression analysis were used to describe the relationship of GFR and Kt/Vurea with nPNA. In all analyses, a two-sided P value of less than 0.05 was considered statistically significant. Of 305 patients who were included in the NECOSAD-2 study, 217 (71%) had received pre-ESRD care (see the Methods section for definition). Data on residual GFR before the start of dialysis were available for 114 (53%) of these patients. GFR could be calculated for 94 patients and was estimated from creatinine clearance and urine production for another 20 patients. Characteristics of these two groups and of patients with missing data are summarized in Table 1. Patients with data on residual GFR were younger compared with those with missing data and more often had peritoneal dialysis as future chronic therapy. However, there was no difference in gender, primary kidney disease, percentage of patients with comorbid conditions, diabetes, or cardiovascular disease. Furthermore, body mass index (BMI) and SGA scores were similar. Reasons for the missing data were violations of protocol with regard to blood sampling and urine collection, e.g., a time period between urine collection and start of more than 4 wk, or missing values for urea and creatinine in either blood or urine. The only difference between the patient group whose GFR was calculated compared with the patient group whose GFR was estimated from creatinine clearance was the percentage with hemodialysis as their future chronic therapy. These two groups combined were used for further analyses. The age of the patients ranged between 19 and 83 yr. One third of the patients were older than 64 yr. Sixty-seven percent had serum albumin levels above 35 g/L. According to SGA, 70% of the patients had a normal nutritional status, 29% were classified as being mild to moderately malnourished, and only 1% were classified as being severely malnourished. The percentages of mild to moderate and severely malnourished patients increased to 33 and 3% when all 305 patients were analyzed, irrespective of pre-ESRD care. The median time interval between the first presentation to a nephrologist and the start of dialysis was 19 mo (range, 1.4 to 256 mo). Ninety percent received pre-ESRD care in a nephrologic outpatient clinic for more than 5 mo. Mean GFR at the start of dialysis treatment was 6.2 (2.6) ml/min per 1.73 m2. Thirty-three percent of the patients had a GFR ≤5 ml/min per 1.73 m2 0 to 4 wk before the start of dialysis, 60% had a GFR between 5 and 10 ml/min per 1.73 m2, and 8% had a GFR > 10 ml/min per 1.73 m2. Mean Kt/Vurea was 1.3 (0.6)/wk. Thirty-one percent of the patients started dialysis with a urinary Kt/Vurea of ≤1.0/wk, and 60% had a Kt/Vurea between 1.0 and 2.0/wk. Only 10% met the DOQI recommendation of a Kt/Vurea >2.0/wk as the starting point of dialysis. In contrast, 69% of the patients had an nPNA(Bergström) > 0.8 g/kg per d. Mean nPNA(Bergström) was equal to mean nPNA(Randerson): 0.9 (0.3) g/kg per d.
Patients were divided into two groups on the basis of their residual Kt/Vurea at the start of dialysis treatment (Table 2). Twenty-nine patients started dialysis treatment with a Kt/Vurea of ≤1.0/wk. Compared with patients who started with a higher Kt/Vurea, these patients had significantly higher plasma urea and creatinine levels. Urea removal, creatinine removal, Kt/Vurea, and nPNA were significantly lower. However, the parameters of nutritional status, such as serum albumin, body weight, BMI, and the number of patients who scored normal at SGA, were similar in the two patient groups. When we divided the patients into two groups on the basis of their residual GFR (≤5 and >5 ml/min per 1.73 m2), the results were similar (data not shown). The subgroup of 31 malnourished patients according to their SGA score had lower serum albumin, lower body weight, and lower BMI than the other patients (Table 3). However, no significant differences between the two groups were present for the estimates of residual renal function and nPNA. A strong relationship was present between nPNA and Kt/Vurea and GFR (Figure 1). Simple linear regression provided slightly higher correlation coefficients than exponential curve fitting: R = 0.85 (linear) versus R = 0.84 (exponential) for Kt/Vurea/nPNA and R = 0.74 (linear) versus R = 0.73 (exponential) for GFR/nPNA. Relationship of the protein equivalent of total nitrogen appearance normalized to body weight (nPNA[Bergström]) with Kt/Vurea (A) and GFR (B). Equations: nPNA = 0.45 Kt/Vurea + 0.38 and nPNA = 0.09 GFR + 0.37. A Kt/Vurea of 1.0/wk and a GFR of 5 ml/min per 1.73 m2 both corresponded to an nPNA of 0.8 g/kg per d.
The present analysis of a representative sample of patients who were starting chronic dialysis treatment in the Netherlands and who had received pre-ESRD care revealed that the average GFR at the initiation of dialysis was 6.2 ml/min per 1.73 m2. The mean creatinine clearance at the start of dialysis in our study was 7.9 ml/min per 1.73 m2, which is somewhat higher than in the early referred groups of patients from the studies of Jungers et al. (7.4 ml/min) (22) and a European multicenter study by Slingeneyer et al. (6.5 ml/min) (23). 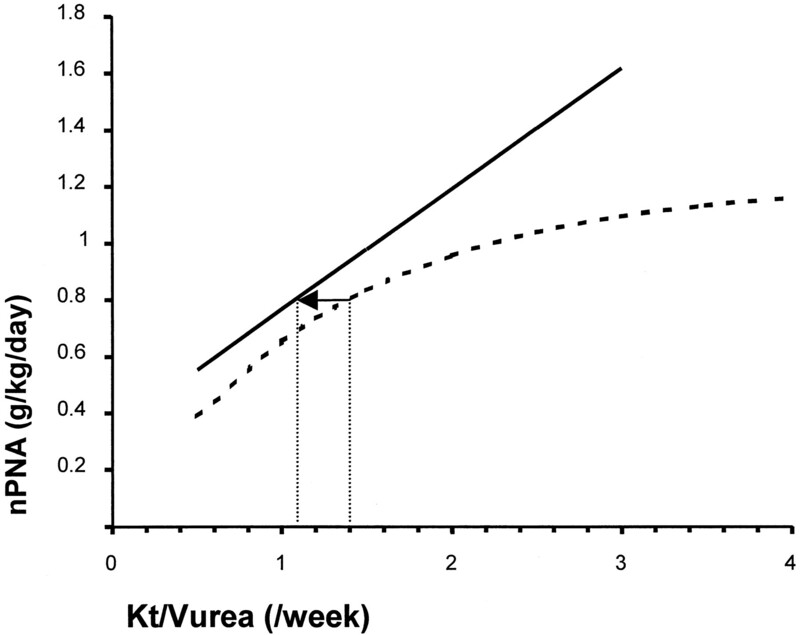 However, only 10% fulfilled the DOQI criterion of Kt/Vurea > 2.0/wk. In contrast, 69% met the nPNA norm of 0.8 g/kg per d.
The present study deals only with patients who had received pre-ESRD care (71% of the patients entered in the NECOSAD study). Excluded were patients who presented with previously unknown renal failure and had to start in an emergency situation. Patients who have received pre-ESRD care are likely to start dialysis in a better clinical condition and to have a better prognosis (4,22,24). However, only in these patients can the time of start of dialysis therapy be influenced. The 29% late referrals in the present study was similar to the 24% reported in a European multicenter analysis (13). A potential bias in the present study is that information on GFR 0 to 4 wk before the start of renal replacement therapy was available only for 53% of the patients. Patients with missing data were slightly older, and more of them had started with hemodialysis. However, there were no significant differences in comorbidity and parameters of nutritional status between patients whose GFR could be calculated and patients with missing data. As 24-h urine collection in future PD patients was often done during hospital admission for catheter implantation, there is a suitable explanation for the overrepresentation of PD patients in the group with complete data. To our knowledge, only one study in which SGA was used for assessing nutritional status at the start of dialysis treatment has been published (25). In the CANUSA study, 45% of the patients were classified as being well nourished with SGA at baseline, 51% had mild to moderate malnutrition, and 4% were severely malnourished (25). The difference between the CANUSA and our study theoretically could be caused by patient selection. All incident patients were included in the CANUSA study, whereas we selected patients who had received proper pre-ESRD care. This was done deliberately, because some patients inevitably will present with unknown renal failure. When we also included the patients who had not received pre-ESRD care, still 64% of the patients had a normal nutritional status. This suggests that factors other than patient selection are important as well. The results of the SGA scores in our population are similar to those from an international study by Young et al. (26) among 224 prevalent patients treated with peritoneal dialysis for a mean period of 32 mo. Nutritional status was normal in 59% of these patients. That study used a method that combined SGA with an evaluation of continuous variables, i.e., serum albumin and anthropometrics. Comparing patients who started dialysis with a residual Kt/Vurea of ≤1.0/wk or GFR of ≤5 ml/min per 1.73 m2 with patients who started with higher levels of residual renal function showed no difference in serum albumin, body weight, BMI, and the number of patients who scored normal on SGA. This suggests that nutritional status was similar in each of the patient groups, yet nPNA, an estimate of protein intake, and urinary creatinine appearance reflecting muscle mass were significantly lower in patients who started with less residual renal function, suggesting the opposite. However, the groups were defined on the basis of Kt/Vurea or GFR. Because both variables are calculated using the same or partly the same parameters used to calculate nPNA or creatinine appearance, it is difficult to draw conclusions from differences in these variables between the patient groups. Interpretation of creatinine appearance raises another problem. Creatinine excretion can be reduced in patients with severe chronic renal failure to one third of the value predicted for patients of the same gender and weight as a result of extra renal creatinine removal (27). The magnitude of this extra renal clearance is positively correlated with the plasma creatinine concentration (28). This extra renal clearance can also explain the lower creatinine appearance in the patients with less residual renal function. For the above reasons, nutritional parameters that are not derived from urea or creatinine kinetics (SGA, BMI, and serum albumin) will allow a more valid comparison than parameters that are calculated from urea and creatinine kinetics. This was supported by the comparison between patients with a normal nutritional status according to SGA and those with signs of malnutrition. Those groups were not different with regard to renal Kt/Vurea or nPNA at the start of chronic dialysis. In the present study, the corrected equation of Bergström et al. (16,17) was used to estimate nPNA, whereas that derived by Randerson (18) was used for the DOQI guidelines. The Bergström formula probably gives the best estimation of dietary protein intake, because it is derived from direct analyses of urea, protein, and nitrogen in urine, dialysate, and feces (16,17). However, the Bergström formula has been reported to give an estimation of protein intake that is on average 4 to 5 g/d higher than that obtained with the Randerson formula (17). Therefore, we also calculated nPNA using the Randerson equation. It seemed that for an nPNA of 1.0 g/kg per d (Bergström), the Randerson formula resulted in a value of 0.94. This small difference is unlikely to have clinical significance. Almost by definition, relationships can be expected between Kt/Vurea and nPNA because both parameters are coupled mathematically (29,30). Consequently, high values for the correlation coefficient between these parameters cannot be interpreted in terms of statistical significance. The same holds true for the relationship between GFR and nPNA, although mathematical coupling is less than for Kt/Vurea. Nevertheless, these regression lines can be useful for comparison with other studies regarding their slopes and their intercept with the x-axis. This has been done by Bergström et al. (31) and Nolph et al. (32), who found that the slope of the relationship is different in hemodialysis patients compared with CAPD patients. We compared the relationship between nPNA and Kt/Vurea from our study in predialysis patients with that found by Mehrotra et al. (11) in a U.S. population with chronic renal failure (Figure 2). The relationship found by these authors was best described by an exponential function, whereas in the present study a linear relationship was established. This may be explained by the higher renal clearances in the patients studied by Mehrotra et al. Their population consisted of prevalent patients with chronic renal failure followed at the outpatient clinic, whereas our patients all were studied 0 to 4 wk before the start of dialysis. In the study of Mehrotra et al., the GFR averaged 14.6 ml/min per 1.73 m2, whereas in our study mean GFR was 6.2 ml/min per 1.73 m2. In the presence of relatively high renal clearances, a curvilinear relationship is more suitable because extension of linear regression to Kt/Vurea values of healthy individuals would predict extremely high protein intakes. Comparing the relationship nPNA/Kt/Vurea in our patients with that of the study by Mehrotra et al. showed similar slopes but a marked shift to the left that averaged 0.44/wk in Kt/Vurea for an nPNA(Randerson) of 0.9 g/kg per d. This suggests that Dutch predialysis patients eat more protein than U.S. patients at the same level of renal Kt/Vurea. The explanation for this difference is unclear. Possible hypotheses for this shift to the left are differences in population composition, accessibility of health care or other socioeconomic differences, and differences in prescribed diets or medications. Most measurements in the patients studied by Mehrotra et al. were done during the first visit to a nephrologist. This might have influenced their results because it is likely that at this time point most of the patients will not have received nutritional advice by a dietitian. Although we made no inquiry on nutritional counseling for the patients of the present study, the duration of the follow-up on the nephrology outpatient clinic implicates that the majority of them will have had dietary advice. Comparison of the relationships (regression lines) between nPNA and Kt/Vurea. The data of the present study (solid line) are compared with data of prevalent patients with chronic renal failure from the study of Mehrotra et al. (11) (broken line). For calculation of PNA, the Randerson equation was used (18), to which the urinary protein losses were added. PNA was normalized to standard body weight (nPNA). Equations: present study, nPNA = 0.43 Kt/Vurea + 0.34; Mehrotra, nPNA = 1.217(1 - e-0.769Kt/Vurea). Defining criteria on when to start dialysis to achieve the best patient outcomes is important and has been a neglected issue for a long time. The publication of the NKF-DOQI guidelines certainly reopened the discussion on this matter. The results of our study suggest that the relationship between Kt/Vurea and nPNA and nutritional status at the start of dialysis treatment may not be the same in different countries and populations. Implications of this are that the NKF-DOQI guidelines on the initiation of dialysis treatment cannot simply be transferred from the United States to other parts of the world. When the aim of timely start of renal replacement therapy is the prevention of malnutrition, clinical judgment combined with a criterion based on nPNA may be more valuable than one based on Kt/Vurea. Well-controlled prospective studies are necessary to determine the effects of nPNA and GFR at the start of dialysis treatment on morbidity and mortality during renal replacement therapy. A. J. Apperloo, J. N. M. Barendrecht, R. J. Birnie, M. Boekhout, W. H. Boer, E. F. H. van Bommel, H. R. Büller, P. C. Chang, F. T. H. de Charro, C. J. Doorenbos, W. T. van Dorp, A. van Es, W. J. Fagel, G. W. Feith, L. A. M. Frenken, J. A. C. A. van Geelen, W. Geerlings, P. G. G. Gerlag, J. P. M. C. Gorgels, W. Grave, R. M. Huisman, K. Jie, W. A. H. Koning-Mulder, M. I. Koolen, T. K. Kremer Hovinga, A. T. J. Lavrijssen, M. P. Merkus, A. W. Mulder, C. Oldenbroek, K. J. Parlevliet, M. C. Reuselaars, J. B. Rosman, J. L. C. M. van Saase, M. M. J. Schuurmans, C. A. Stegeman, P. Stevens, J. G. P. Tijssen, R. M. Valentijn, G. Vastenburg, V. M. C. Verstappen, H. H. Vincent, and P. Vos. This work was supported by grants from the Dutch Kidney Foundation (E.018) and the Dutch National Health Insurance Board (OG97/005). ↵ a See Appendix for all participants.